Once upon a time, Sony ruled Japan. Those days are over. Don't believe me? Just look at how the Japanese media keeps turning the Tokyo-based electronics maker into a punching bag. This sort of thing isn't unique to Sony; the Japanese media was dishing the same punches to Nintendo last year. Sure, sometimes jabs are warranted—especially if a company seems to be on the slide or underperforming. Call it "tough love." 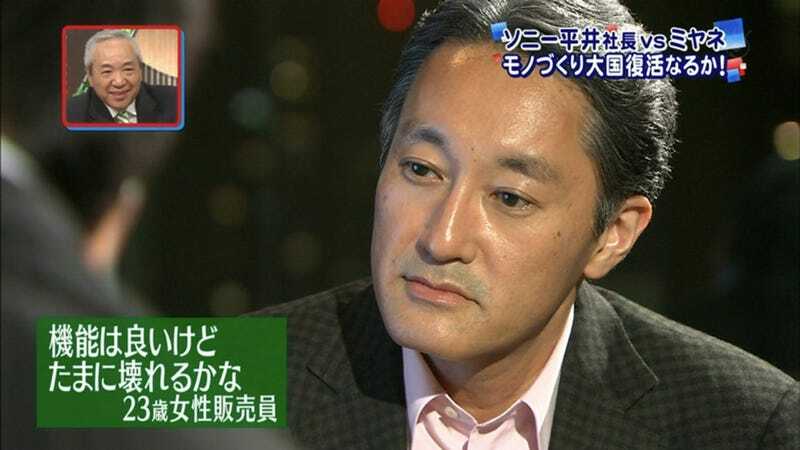 This past weekend, Japanese news show Mr. Sunday had on Kaz Hirai to give his pitch about "One Sony" (a more united, stream-lined Sony) and how he's going to be Mr. Fix-It. The show had a list of comments—not so nice comments—and then read them to Kaz Hirai's face. Look at the other guy, and look at him smile. Awkward! Late last week, another Japanese news show ran footage of Japanese people being totally different—cold, even—to Sony. Tough love, tough love.